This filly is just starting her retraining but has a very good attitude. 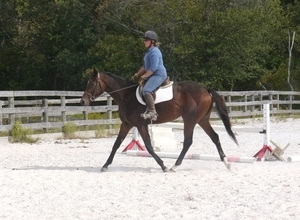 She's starting to go under saddle, walking and trotting and working on her canter--check out the video below. She's nicely put together; Heather says "she's got a good brain." She's young and still growing but in time we think she'll make a great horse. She's learning to lunge as well. She has front shoes. Turquoise Shell from Sarah Jaffe on Vimeo.